DiorShow mascara has always been an object of admiration for my model-friends. I used it myself for ages. When the new Blackout came out I was eager to try it… to find out it is very different from what regular DiorShow is. DiorShow Blackout is not just a darker colored, it has different brush and different qualities to it. It elongates more than DiorShow but it doesn’t have the same plumping effect it’s supposed to, and it clumps a lot more. 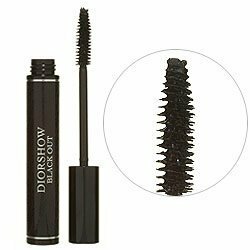 If you love long, curly eyelashes with lots of volume you are probably fan of either DiorShow or Lancome Hypnose mascara and you are most likely will not applause to the new Blackout version. Here what my girls think of it. Shortly, I will have another report for you, girls. My new “miracle-discovery” that I am rating even higher than my favorite DiorShow mascara. Check out the new Christian Dior Diorshow Black Out , and the regular Diorshow Mascara . Make sure to check for special discounts and sales.